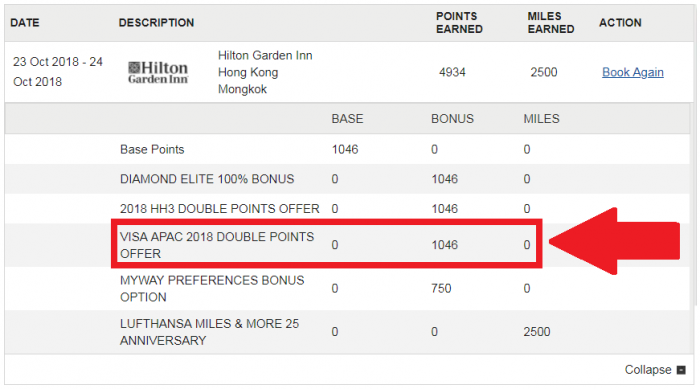 Last week, I wrote (access here) about Hilton Honors promotion for stays in Asia-Pacific that are paid using Visa card between October 1 – December 31, 2018. Members can earn double points at participating hotels after registering for this offer. You can combine this promotion with other Hilton Honors offers like what I did below. This stay was paid using a Visa card issued in Europe. Hilton Honors has had similar promotions in the past, and as long as you used any Visa branded card to settle the bonus points have posted. The T&Cs have a list of cards that you would need to use but just use ANY Visa.